Solve fiendish puzzles! Get betrayed by your closest friend! Die horribly at the hands of angry Romans! A routine adventure with Professor Inkwell's time machine goes drastically wrong and the investigators find out that they have already been sent back in time! Now you have sixty minutes to solve the clues left by your future selves to escape the time loop - and figure out which of your team was responsible for sabotaging the time machine in the first place. Inkwell Investigations runs Escape Games; timed 1-hour adventures that require puzzle solving and teamwork to escape alive, intact and sane. Each investigation lasts around 90 minutes and is suitable for a team of 3-8 players of ages 7+ (Under 18s must be accompanied by a guardian). Please arrive ten minutes early to give your party time to arrive and settle in. Our investigations primarily take place in the Mile End area of London, which is accessible by the Central Line tube, 15 minutes from Bank. We will provide the exact address in your booking email. Our pilot investigation, Murder History, takes players on a journey to escape a doomed time loop, using clues left by their own trapped selves. Stay tuned for future investigations, peril and terrible choices on the part of the mysterious Inkwell family! Your wits, your eyes and your physical body. Ghosts may find these games difficult. ​Beyond this, all elements of the games are provided. Some of our games may be set outdoors and while protections against inclement weather (rain - it's Britain) will be provided (umbrellas) if you are going to play the game outdoors we recommend bringing warm clothing appropriate to the season. ​A good understanding of English is required to play these games. At least one player must be able to speak and read English. So this is an Escape Room, right? We get locked in a room? This is a common misconception. We are a pop-up Escape Game, a subset of the Escape Room genre. In a classical Escape Room you are locked in a sealed physical space with 1 hour to solve your way through puzzles to make your way out. These may have varying amounts of narrative, from a fully-contained story to no explanation for your situation at all. ​In our Escape Games you are instead pitted against a terrible scenario that you have 1 hour to escape by solving your way through puzzles and riddles. You are set within a rich, flavourful world with a clear narrative that involves you each step of the way. 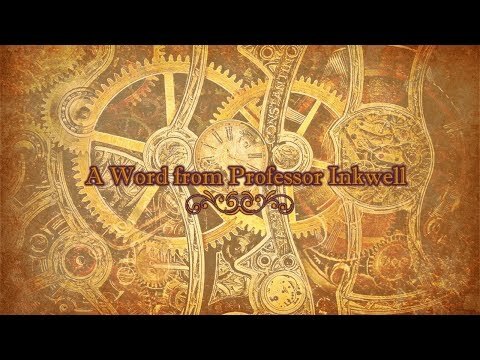 Furthermore, your party will be accompanied by a trained actor and games-master in the guise of a member of the Inkwell Family, who will help immerse you in the world. ​In fact, in practical terms the only difference between a classical Escape Room and our Escape Game is that we have shrunk the confines of the puzzles down to a more portable case and placed the 'walls' of the room in your mind. We had a really good time trying to solve the clues that were sufficiently challenging to keep us entertained. We were kept entertained until the last second! A great activity for our diverse grown up family and has made lots of great memories for us to look back on. You certainly know who is competitive or not! This was a lot of fun for me and my friends. The puzzles were good and once your into it the competitiveness kicks in. It's really nice being one of the few escape rooms which take larger groups. Being outside means that it's a great outdoor activity to do if you want to do something different. An amazing family-friendly mystery for everyone! Highly recommend this to all with young kids - there’s something to do for all ages! I booked Murder History because it was the only one I could find that could take our group of 8. It was great fun. Our host was absolutely brilliant. The puzzles were challenging but not impossible and there were plenty for all members of the team to get involved with. If you get stuck then your host has clues that can nudge you in the right direction without giving away the answers. Definitely one I recommend, especially if you have never done anything like this before. Considering the weather we have been having this summer it was nice being outdoors. Really looking forward to any other adventures Inkwell Investigations may need help with. The host made this for us, really immersive experience with tough clues and in a great location! Wonderful experience. Would definitely recommend. Lovely host and an amazing challenge. Professor Inkwell was brilliant! We did the murder history game as a team building exercise for the office. It worked extremely well and we will definitely participate in a game like this again. It was not easy - and we had to draw on expertise from all participants - which is great for a team building value! I personally loved the stories that came with each character - very well thought through! Thank you for a brilliant afternoon of fun! Had a wonderful time with Professor Inkwell! A very well thought out game, in a beautiful settling with a very entertaining and witty host. Booked this for myself and two others and was very enjoyable, would recommend for small and big groups. For a lover of puzzles and adventure it’s a must! !